Are you into modern architecture? Many people now are. The big question is: WHY? Let’s say your taste is more on the opposite side – for instance, rustic country. There are still certain elements of modern design that you will find appealing. This is because the fundamentals of modern architecture are simple and clean. It lives by the philosophy that form should follow function. This is why modern architects promote simplicity as well as clear views of structural elements. Modern architecture utilizes the actual structure and materials used when building instead of covering them with unnecessary designs. This is also why some modern designs often feature elements of glass, wood and steel to be able to show-off these industrial materials. The terms modern and contemporary have often been interchanged in the world of design, thus resulting in a bit of confusion. So, is contemporary design same as modern design? The answer is no – and a little bit of yes. Contemporary literally means NOW. Modern, on the other hand, refers to technological and engineering developments that go back to the turn of the 20th Century. 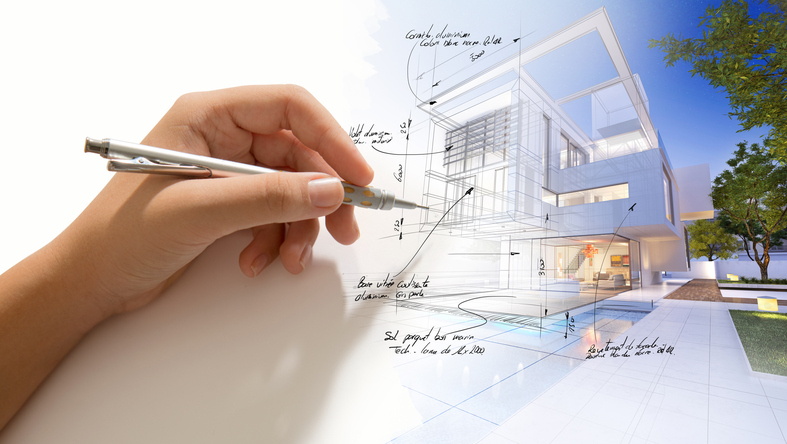 Simply put, modern architecture focuses more on structural materials such as concrete, glass and steel. Contemporary design may also use those elements, but its designs are considered to new or re-thought. With these definitions, the two designs will always be mixed with one another. Even if it is simple in design, modern architecture is unique. In fact, some of the more famous modern architects such as Frank Lloyd Wright have created several of the most unique designs to date. Though most modern designs come with flat roofs and boxy styles, they look anything but boring. Take a look around your city streets and neighbourhoods and try to observe which architectural designs stand out to you the most. Is it the traditional designs or the unique modern ones? If you really take time to look at a modern home, you will see that its angular roof lines (which is prominent in modern design) are very unique. Everything from the exposed structural elements, vaulted ceilings, and even the unusual linear elements – these factors create a unique, artistic design that you cannot help but be amazed with. Some critics of modern architecture point out that it is cool and cold. However, a large number of modern designs use elements that are naturally warm and inviting, such as stone and wood. Large windows that let in more natural light, floor-to-ceiling stone fireplaces, and vaulted post and beam ceilings – these add more warmth and character to a home. Even if the pattern may be clean, linear and uncluttered, there is warmth in modern architecture. So, what is not to love about modern architecture, right? Not only does it present structural beauty, its designs are also unique, as well as warm and inviting! If you are planning to have a home that is modern in design, give us a call today! We can surely help you out! This entry was posted in Custom Homes, New Homes, Remodeling and tagged modern architecture, modern homes, new builds, new homes. Bookmark the permalink.